This Arizona wildlife park is amazing! Located in Camp Verde, Out of Africa offers visitors a chance to learn about and get up close to wildlife from all over the world. We had heard about the Arizona wildlife park called Out of Africa from a fellow blogger. It sounded like such a cool place and we were surprised we hadn’t heard of it sooner, especially since we had already visited Phoenix a couple of times. So, we made it a plan to visit Out of Africa the next time we were in Arizona. Where Is Out Of Africa Wildlife Park? 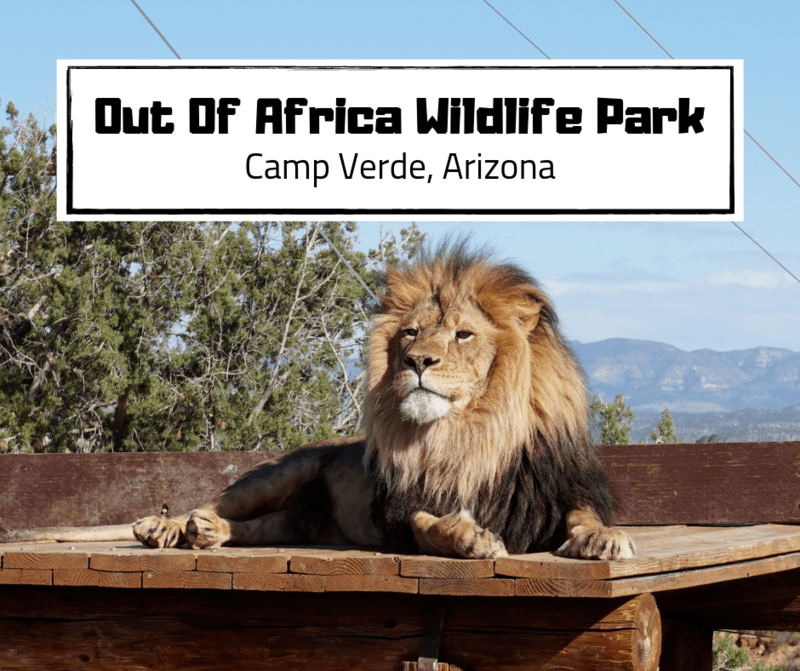 Out of Africa Wildlife Park is located in Camp Verde. It’s just under an hour and a half drive from downtown Phoenix and on the way up you’ll see some great landscapes full of cacti. It’s a perfect stop if you’re heading north to Sedona, Flagstaff, or the Grand Canyon. You can purchase your tickets online or at the park. General admission includes your entry, the African Bush Safari Tour, access to their tram service, and their various animal shows. What costs extra are the Zip Line, Authentic Unimog Adventure Tour, Feed-a-Tiger, and the VIP Behind-the-Scenes Tour. We should also mention the Out of Africa birthday deal. If you go on any day during your birthday month the cost of your ticket is only $10!! Just make sure you have your ID or birth certificate. Additionally, you can leave and reenter the park on the same day. Just make sure to keep your wristband on. The safari tour was definitely our favorite part of the experience (it runs continuously throughout the day). You’re given a piece of celery so you can feed a giraffe and REALLY see it up close. We recommend sitting right behind the driver, because then if they give any animals extra treats you’ll be front and center. We got to feed a giraffe! The animal shows they offer are cool, but we also enjoyed walking around the park on our own and seeing the animals that way. It’s a huge property, and they do have a complimentary tram to help you get around, but we liked walking. Make sure you have comfortable shoes though. It is all dirt roads and if it’s rained at all there will be mud. During the Tiger Splash Show, trainers play with tigers and get them to jump in the pool. If you choose to zipline, you can zip right over many of the animals! He’s sleepy from lounging in the sun all day! At Out of Africa, they do not allow pets or service animals. This is due to the fact that they may trigger any of the animals’ natural instincts and if a keeper is inside with an animal during that, it’s no bueno. There is no wheelchair or stroller rental at the park, but the trams and safari vehicle can accommodate wheelchairs. We suggest you check the local weather and dress appropriately. Make sure it’s the weather for Camp Verde, as it is often different than Phoenix and Flagstaff weather because of its location and elevation. And wear sunblock! This Arizona wildlife park is really awesome and we definitely recommend it for all the animal lovers out there. We love that so much is included with your ticket and that you get to see so many of the animals up close. It’s an experience we will never forget. Sedona is one of those surprising places. I seriously thought this post was about a country in Africa, but was pleasantly surprised that it was located in Arizona. Another informative piece, kudos for this article! Thanks Danny! It felt like we were in Africa too. They did a great job putting it all together. Sounds like a fun day Vicky. Plus the background and climate mimic the African experience well.